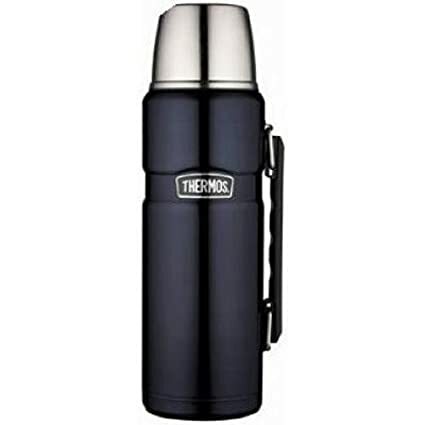 A thermos is an excellent way to take warm or cold drinks and food with you wherever you go. A cold winter’s day outside can be made more enjoyable with hot cider to keep you warm all day. But not all thermoses are made the same. Design and manufacturing can make a difference in their ability to maintain internal temperatures. Because you’ll be using it when you are away from home, durability is a key factor. There are good options available in many prices ranges that will meet your needs, here are some of the best we found. The Thermos Stainless King 40-Ounce Beverage Bottle (King) uses the latest technology to maintain liquid temperature. It comes in two colors – cranberry or midnight blue. Double wall, stainless steel is used to make the King both inside and out. Stainless steel is the ultimate in durability and strength. It resists rusts and can handle temperature extremes without damage. It is also easy to clean. The double wall creates a barrier between the liquid inside the King and the outside air. This space is filled with insulation using vacuum technology. Vacuum insulation technology creates a protective barrier around the liquid inside. Traditional containers may have a filled double walled space but that there are still air particles in that space, which means hot and cold air can move through it. This causes the liquids inside to lose their temperature. With vacuum insulation technology, the material between the double walls is vacuum sealed inside so that there is no air in the space between the two walls. This prevents heat from moving in either direction. Because of this technology, the King can keep liquids cold or hot for up to 24 hours. The double wall design with the vacuum insulation also keeps the outer wall of the King at a stable temperature. The outside doesn’t get hot when containing a hot liquid. When holding cold liquids, condensation doesn’t build on the outside. Forty ounces is large enough that you’ll have liquid for one person that will last for a day or enough to share. You can take it on an overnight backpacking trip and still have a hot drink the morning. Ice cold lemonade is yours to enjoy on a hot beach. The King gives you the ability to enjoy your activities while still having some of the comforts of home. A twist and pour stopper helps to prevent spills and leaks. The stopper does not need to be completely removed to pour. If the stopper isn’t completely sealed and the King tips over, less liquid will come out. When the stopper is open, less outside air can get inside to affect the temperature of the contents. Rubber gaskets are used around the opening to create a tight seal, trapping the hold or cold inside. The stainless steel cap is insulated to provide another temperature barrier. It can also be used as an insulated drinking cup while you are away from home. A handle on the outside of the King makes it easy to carry with you to work or to use when pouring. For the best results, warm or cool the King before adding a beverage. This can be done by putting warm or cold tap water inside, sealing it, and leaving it for a few minutes before placing the intended liquid inside. This way no energy is lost to adjustment in temperatures. The King is made of BPA free materials. It comes with a 5-year limited warranty. 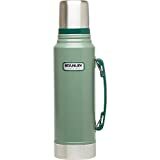 The Stanley Classic Vacuum Bottle (Stanley) can be purchased in four different sizes – 1.4 quart, 1.1 quart, 25 ounces, and 16 ounces and two colors – green and navy. While the Stanley comes in four different sizes, each size does not have the same capabilities or features. For example, the larger two sizes have handles, one of which can be fitted tight to the thermos when packing, while the smaller two sizes do not have a handle. Also the specifications for how long the thermos can keep liquids at temperature vary by the size of the thermos. The 1.4-quart bottle, for example, can maintain temperature for up to 32 hours while the 15-ounce bottle can only do so for 15 hours. Before selecting a bottle, be sure that the size you want has the features you need. The Stanley is made of durable stainless steel, which means it resists corrosion, can withstand temperature extremes of hot and cold, and is easy to clean. A Hammertone powder coat on the exterior gives the Stanley its identifiable classic look. This coating is also durable and won’t chip with heavy use. 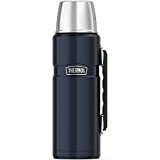 Double layer stainless steel design creates an air pocket between the portion of the thermos that contains the liquid and the outside air. This space is filled with vacuum-sealed insulation. Vacuum sealing removes all the air from the space so that heat cannot travel in either direction. This same barrier also prevents the exterior from becoming too hot or from building up condensation when holding cold beverages. A wide mouth design makes cleaning easier because you can fit the head of a scrub brush in the thermos to get it fully cleaned. The wide mouth also allows you add ice to your drinks for better temperature control. The stopper creates a good seal to keep temperatures steady. The lid is insulated and can be used as a drinking cup. When using the lid, be sure the stopper is securely closed to prevent spills and to maintain internal temperature. It is best to prep the Stanley before pouring in the liquid. You can do this by putting in hot tap water five minutes before to warm the inside or putting cold tap water for cool beverages. This gets the thermos to the right temperature and helps it to hold it longer. Some users have had problems with rust developing on the lip of the Stanley. Report any problems promptly to get the best resolution. The Stanley is BPA free. It comes with a lifetime warranty. The Thermos Stainless King 16 Ounce Travel Tumbler (Tumbler) is a smaller more portable version of the King. This is the kind of thermos you can use on the daily commute. A tapered bottom allows it to fit into the cup holder of your car. A handled version is also available. The interior and exterior are made of double-walled stainless steel that is durable and resists rust. Stainless steel also allows it to withstand high and low temperatures without damage. You can take your morning coffee with you to work without worrying about it corroding the interior of your thermos. Double walls created an air pocket that is vacuum sealed with insulation. Vacuum insulation technology eliminates air pockets between the two walls so that less heat is lost between the two. Heat or cold will stay inside the thermos for longer. This also keeps the exterior temperature stable. While the exterior will be warmer when holding hot drinks and cooler with cold, the exterior temperature will always remain comfortable to hold with no condensation from cold drinks. The Tumbler can keep hot liquids hot for up to five hours, giving you enough time to enjoy a morning’s worth of coffee. Cold liquids will stay chilled for up to 9 hours, providing most of your day with a cool refreshing drink. The mouth of the Tumbler is wide enough that you can put in ice to keep your liquids cold longer. It is also the right height to fit in a standard sized coffee maker for a single serve portion. No messy pouring, the coffee can be directed deposited into the Tumbler. A built-in tea hook can hold your tea bag aloft so you get consistent seeping into your hot water. Keeping your drink sealed securely is important to prevent leaks and spills as well as maintaining the interior temperature. The lid, itself seals by twisting on. The Tumbler has a Drinklock sealing lid that with a 45-degree twist opens and closes for drinking on the go. A scrub brush can fit inside the body of the Tumbler to reach any stuck on residue. The lid disassembles into five pieces which allows you to reach all areas for cleaning. All parts can be cleaned in a dishwasher. Gaskets and sealing rings can then be put back in place after cleaning. Before putting in the beverage, prepare the Tumbler by placing hot tap water in it 5 minutes before putting warm beverages inside. For cold beverages, pour in cold water and let it sit for 5 minutes. This preparation means that no heat or cold will be lost once the beverage is in the Tumbler. The Tumbler comes with a 5-year warranty and is BPA free. The Red Stainless Steel Vacuum Insulated Flask (Flask) can hold 16.9 ounces and is an inexpensive thermos you can take with you anywhere. A sleek design gives the Flask a minimalist look. It is slim and lightweight, which allows it to fit in most car cup holders. It comes in a fun red color. Durable, stainless steel, double-walled construction gives the Flask is temperature maintaining properties. The space created between the two walls is filled with vacuum-sealed insulation. Eliminating as much air between the two walls as possible is the best way to prevent heat from escaping or entering the interior of the Flask. It also prevents the exterior from condensation and getting too hot. Stainless steel is also easy to clean and resists rust and corrosion. It also prevents odors so that your drink doesn’t take on unpleasant tastes. The lid creates a tight seal when closed and can be used as an insulated drinking cup when removed. Before placing the lid back on the Flask, wipe it down with a napkin or tissue to prevent liquid from running down the side. You can pour from the Flask without removing the stopper completely for fewer leaks and spills. The stopper can be raised by pressing a button on the center. When you’re done simply push it back into place. The pour spout is a separate piece from the stopper. It creates a better angle to pour from the Flask. The stopper, spout, and lid can all be removed for easy cleaning. Thermoses come in all sizes and types. There are large 2-quart models as well as single serving 16-ounce sizes that look more like an insulated cup. The purpose for your thermos will determine what the right size is for you. If you want a thermos to take a morning cup of coffee with you to work, a 16-ounce thermos should do the trick. They come with or without handles. If you commute in a vehicle, be sure the thermos will fit in your cup holder for convenience. For those that want to take more than one serving, a larger 25-ounce thermos comes with similar features to the 16 ounce with the ability to carry more volume. Large one or two-quart thermoses are best for a long day or short overnight trip. They not only hold a large volume of liquid but are usually packed with more insulation and keep drinks hot or cold longer. Depending on the kind of thermos you are looking for, it may or may not have a handle. If you are commuting to work, a thermos with a handle may be perfect for you to sip as you go. If you want to pack your thermos in a backpack on the commute, you will need a sleeker design without a handle. Some models have a removable handle that can give you both options. For larger thermoses that you plan to take on long trips, be sure the handle can be collapsed against the side of the thermos to allow it pack tightly. Double-walled, stainless steel construction is the most durable. Stainless steel resists rust and corrosion, handles both hot and cold temperatures, as well as resists odors. Most of the time, it can be cleaned in a dishwasher. The insulation between the two walls is important. While you may be tempted by a vintage thermos, the insulation used between the walls will have some air in it which means it will lose heat faster. New technology has led to the development of vacuum-sealed insulation that eliminates air pockets between the walls of the thermos. Be on the lookout for a warranty in case of any defects in materials or manufacturing. The lid and cap can make all the difference in the thermoses ability to prevent leaks and spills. Many come with a stopper that can stay in place while pouring liquids. This allows you to control the flow of the beverage as well as prevent all the liquid from spilling out if the thermos tips over with the stopper open. Some versions also have a separate spout piece. This allows you to choose whether or not to use the stopper at all. However, it is one more place for a possible leak to develop and one more piece to clean. Lids that are designed to be used as an insulated cup are the most convenient when traveling or hiking. However, the lid won’t be attached in this case, making it easy to lose. Small, travel mug type thermoses have different requirements for their lids. The lid not only needs to be secure but the mechanism that opens and closes on the top allowing you to drink with the lid on, must also be secure. Extra features like a tea hook or optional ventilation holes are a matter of personal preference. Be careful of ventilation holes as they can leak if the thermos is tipped over. This type of thermos functions more like a cup and must be treated as such. All parts – lid, spout, stopper, rings – should be able to come apart to be cleaned. If not, you risk building up residue and possibly bacteria. Parts that can be cleaned in the dishwasher will be the easiest to maintain. When you know what your needs are, you will be better able to find a thermos that is right for you. A thermos can be the answer to having your favorite coffee brew with you all day long or having refreshing lemonade ready to pour on your hike. A well-made thermos can last for years. With the combination of technology and construction, you’ll be able to find a thermos to meet your needs.